hpi-racing SC-15wp esc Waterproof Electronic Speed Controller Sport Control Rc. Condition is Used. Dispatched with Royal Mail 1st Class. With reverse sport control built in. This is a rare item, you can’t buy this type of controller anywhere. These are often used in crawler vehicles driven into mud. This controller was used in a Hpi-E10 drift car now upgraded to li-po. Thanks. / Burst Current : 25A/100A BWD Cont. Add To Favourites. UK - Northern Scotland, Highlands, Islands £3.50. UK - Northern Ireland £3.50. UK - Isle of Man, Isle of Wight £3.50. With the capacity to handle 2S and 3S LiPo power, the Flux EMH-80A ESC is the perfect match for the #112850 MMH-4000KV 1/10th scale brushless motor. ESC Type: For Brushless Motors. Continuous Current: 80A. HB HPI Racing Hana HB54021 RTF Speed Controller. Condition is New. Dispatched with Royal Mail 1st Class. Use with brushed motors down to 15 turn. LiPo safety cut-off. When the throttle position is at neutral, brakes will be applied automatically. UK - Isle of Man, Isle of Wight £3.50. ESC Mode: Multi Profile. ESC Type: For Brushed Motors. UK - Northern Scotland, Highlands, Islands £3.50. With the capacity to handle powerful brushless motors, 3S (11.1 volt) LiPo batteries or up to 12 NiMH cells (14.4v) with up to a 4600Kv motor, plus convenient and strong connectors, the Motiv will take you to the limit safely and easily! 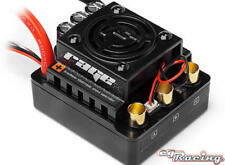 The Flux Rage is a tough 1/8th scale brushless ESC that's designed to take the rigors of rallycross buggy and truggy racing and bashing. Have a blast with the normal forward/reverse/brake mode or switch it into race mode for maximum power - you can even use this in powerful crawling machines with the forward/reverse only mode for no braking action! HPI VORZA Flux. With the possibility of 2 3s LiPo batteries (which are about 22Volt!). A big fan sits on top of the housing and is protected by a guard. It is important to use the right combination! HPI Trophy Truggy Flux. HPI Flux Scream brushless motor. FLUX brushless system consists of Geeignet für Maßstab 1:8. Geeignet für Fahrzeugtyp Autos & Motorräder. PART NUMBER(S): 114712. HOT BODIES / HPI. Motor Limit: 2S LiPo or 6 cell NiMH: 540 or 550-size motor great than or equal to 12 turn, RPM over 30,000 at 7.2v. Motor Limit: 3S LiPo or 9 cell NiMH: 540 or 550-size motor great than or equal to 18 turn, RPM over 20,000 at 7.2v. Manufacturer Part Number: 120021. MPN: 120021. Extra-thick 12 gauge wires and 6.5mm bullet connectors lead to the motor, while a pair of polarized connectors let you attach any batteries equipped with Deans style or Star plugs. Der SC-3SWP2 ist ein leistungsstarker und robuster Fahrtenregler, der sich optimal für RC Fahrzeuge jeder Art eignet! Der SC-3SWP2 ist ideal für alle 1:10 Modelle geeignet Verpassen Sie Ihrem Modell den SC-3SWP2 und überzeugen Sie sich selbst von seienr Robustheit und Vielseitigkeit! Um den Schalter montieren zu können ist Erfahrung beim Löten notwendig. 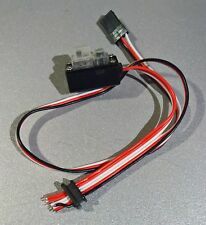 HPI Sc-3sWP2 ESC with Tamiya type Battery Connector, Female Bullet. HPI Vehicle Parts. Reverse Burst Current: 90A. Forward Burst Current: 180A. Nine Eagle Solo Pro. greater than or equal to 12 turn, RPM over 30,000 at 7.2v. 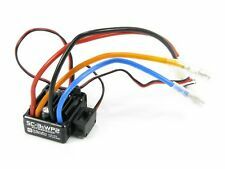 If you've got plenty of power to strap into your RC, you can count on the SC-3SWP2 to handle it: able to handle LiPo power of 2S and 3S or between 5 and 9 NiMH cells, this speedo can handle just about anything can you fit into the chassis! Es handelt sich um ein original Zubehör-/Ersatzteil für (einen) HPI Trophy Flux Buggy H101716. Es handelt sich hier um ein original HPI Produkt. This is an original HPI product. Continuous Current: 80A. Identical to Maverick MSC-29BL-80WP ESC. Compatible with sensorless brushless motor. 3 running modes (“Forward with brake” mode, “Forward/Backward with brake” mode, and “Rock Crawler” mode). 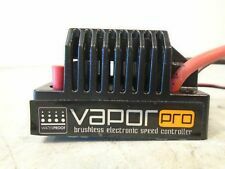 The VAPOR Pro features an integrated cooling fan to keep it cool in tough conditions. The Flux VAPOR Pro ESC is reversible so you can back out of jams with ease. And for maximum adjustability it's fully programmable with our optional#100573 USB Programming Kit. Weight: 41g. PWM Frequency: 1Khz. Resistance: FWD, 0.002 Ohm. BWD, 0.004 Ohm. Reverse Burst Current: 90A. This is a NEW Genuine HPI 120021 Flux ELH-6S Brushless Waterproof ESC : Vorza Flux / Savage XL Flux. Part # 120021. Motor Limit: 4S LiPo <3000KV, 6S <2400KV. HPI Vehicle Parts. With the ability to handle twin 3S LiPo batteries (that's more than 22 volts of LiPo power!). All warranty through manufacturer. We will respond as soon as possible. This item was never opened. This is the HPI Flux Reload V2 Waterproof Sensorless Brushless ESC. Combine with the FLUX Shot BRUSHLESS Motor (HPI1012789) for a major boost to any standard brushed motor RTR kit! Sensorless: Yes. Overheat protection for the ESC, Throttle signal loss protection and motor blocked protection. Can handle 40% MORE power than Motiv ESC Ultra low resistance (.0007 ohms / phase). Connect to your PC using the#100573 Castle Link for super-easy customizations! High performance cross-cut aluminum heat sink. LiPo safety cut-off. Dual bullet-style motor plugs. HPI Vehicle Parts (207). HPI Sc-3sWP2 ESC with Tamiya type Battery Connector, Female Bullet. Manufacturer: HPI Racing. Reverse Burst Current: 90A. Forward Burst Current: 180A. greater than or equal to 12 turn, RPM over 30,000 at 7.2v. 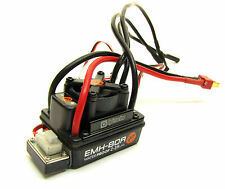 The HPI Flux ELH-6S ESC is the perfect match for the HPI Flux MLH-2200 1/8th scale brushless motor (HPI120010). With the ability to handle 6S LiPo batteries (that's more than 22 volts of LiPo power!). Continuous Current: 80A. With the capacity to handle 2S and 3S LiPo power, the Flux EMH-80A ESC is the perfect match for the #112850 MMH-4000KV 1/10th scale brushless motor. HPI Racing FLUX EMH-80A Brushless Waterproof ESC (1 pc). (This is a NEW Genuine HPI 117110 SC-3SWP3 Crawler Edition Waterproof ESC : Venture Toyota FJ Cruiser. Part # 117110. 1) F/R with 100% Drag Brake - Crawler mode for steep and rough terrain. HPI Vehicle Parts. HPI Racing 120026. With the capacity to handle 2S and 3S LiPo power, the Flux EMH-80A ESC is the perfect match for the #112850 MMH-4000KV 1/10th scale brushless motor. Waterproof and dust-proof. The ESC has been designed to work in wet conditions. You can also save various profiles to have profiles for racing, insane speed runs, stunts, fun running and more. With the Flux Alphastar 2350 and Q-base combo, you get power optimized for 4S LiPo batteries, with custom tuning thrown in for fun!